How Is Zuri Decking Made? How is premium Zuri decking by Royal manufactured? 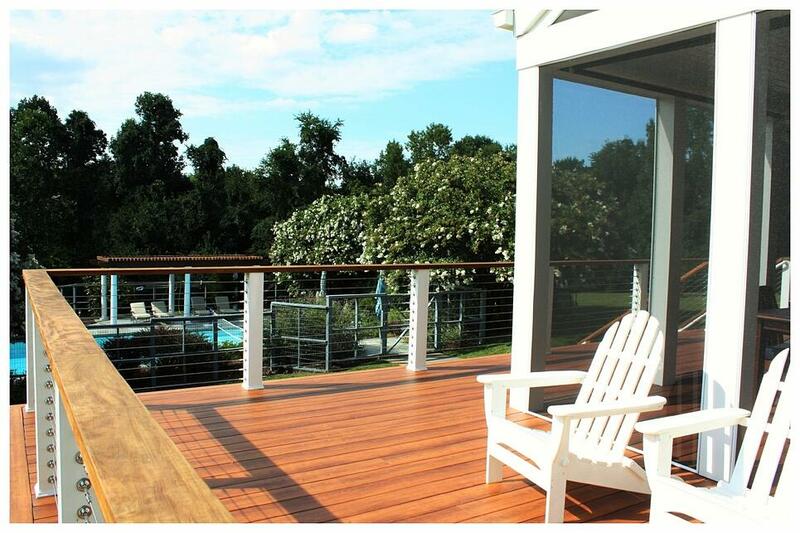 From the first glance, low-maintenance Zuri decking distinguishes itself from Zuri competitors. No other product on the market so closely resembles the look of natural wood, and those aesthetic and quality differences largely come down to how each individual Zuri deck board is produced. Every board of Zuri premium decking by Royal Building Products has three main pieces that work together to form the end product. There’s a substrate, a photo print, and an acrylic capstock. This is true for any of the Zuri decking colors and types of Zuri decking, as Zuri does not need to be stained. The base of every Zuri board is a cellular PVC substrate. This PVC resin has had air blown into it so it’s not as rigid as typical PVC, and this process also enlarges the PVC. This gives each board a bit of natural give and flexibility, which contributes to the manufacturer's goal of approximating natural wood. It also minimizes the chance of cracking or breaking, as each board can bend and accommodate added weight or natural fluctuations. To achieve this resin core, it goes through a manufacturing machine that can create any width or size board. This means the decking boards can often work in conjunction with any number of deck plans because the size can be accommodated via the machinery. These unique properties have added benefits for Zuri contractors and Zuri deck builders who want to implement customized Zuri decking design ideas, even if they are just learning how to install Zuri decking. This layer covers the cellular PVC substrate and marks one of the more distinguishing characteristics of the low-maintenance decking line by Royal Building Products. The print replicates the look and even the texture of natural wood. While some composite decking strives for the same result, the illusion is most frequenlty disrupted by repetitious grain patterns printed on large volumes of deck boards. This is usual subtle, but it destroys the notion that its real wood, for both homeowners and experienced Zuri deck builders alike. Zuri, however, works to eliminate this repetition, so each board becomes unique—just like each cut board of natural hardwood would be unique. To achieve this layer, it goes through a separate machine to attach the print to each board. The finishing layer is a durable acrylic capstock. It goes through a third machine to achieve this last step in the manufacturing process. Zuri decking boards have the added benefit that they can be cut with regular woodworking tools by Zuri distributors and installers. There are also no concerns about breathing toxic elements from the boards if they are cut. For example, there won’t be any silicon dust generated. This means you don’t have to wear a mask or any gear that specifically protects against inhaling undesirable residue for any Zuri trim. 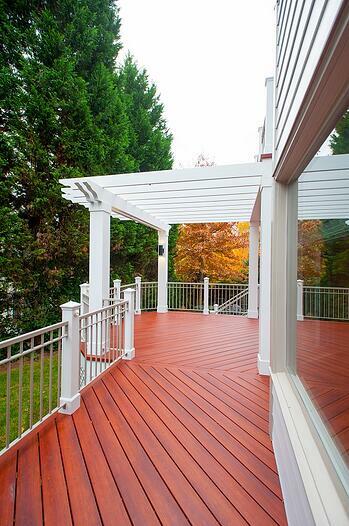 Zuri Premium Decking is manufactured in Marion, Virginia. Being made in the United States means any replacement boards or replacement pieces are going to arrive quickly. It also offers the confidence that’s inspired by buying products made in the States. This helps ensure not only the quality of the end products but fair and effective manufacturing techniques. If a product is shipped or manufactured within 500 miles of its market, it meets certain eco-friendly (“green”) standards. Zuri adheres to and meets these requirements, therefore Zuri is environmentally friendly. Also, the core of a Zuri patio board is 100 percent recyclable. This is yet another way the manufacturing process for the Royal product is at the forefront of premium decking technology. For more information about how Zuri Decking is made, the specifics of its manufacturing process or where can you buy Zuri decking, shoot us a message! 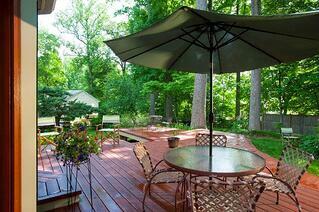 We're a certified Zuri decking contractor for the DMV area.